Whether you have a large or small ensemble, the Cast Sheet is a very useful tool. The Cast Sheet will display and print all symbols, labels, and names of the performers in the drill. 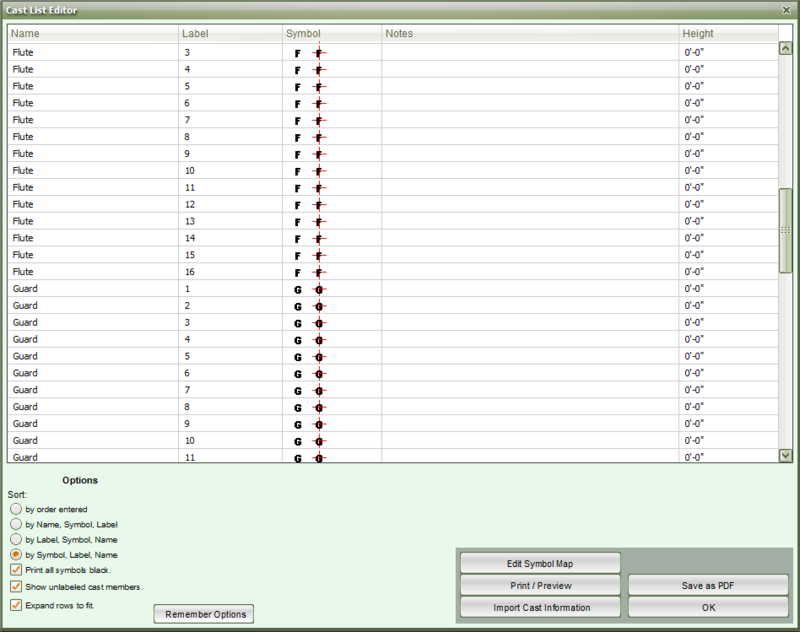 When you select Print Cast Sheet from the File menu the Cast List Editor will display. Print Sort order will sort the names in the Cast Sheet according to one of the following options: by Symbol, Label, Name; by order entered; by Name, Symbol, Label; or by Label, Symbol, Name. The Name can be entered using the Performer Labeling tool or directly in this window. The Figurine column allows for the assignment of figurines to each performer in the Cast List. These figurines are shown in the Classic Perspective View only. Notes is a place on the printout for taking notes on performers. Print all symbols black will print all symbols in the Cast List black instead of the color defined by the Label tool. Show unlabeled cast members shows all performers (even the performers with no label) on the Cast List Editor window and on the printout. Hiding unlabeled performers from a printout is useful for stationary performers (such as the pit). Edit Symbol Map opens the Symbol Map Editor. Here you can set default uniforms and equipment for symbols you frequently use. Import Cast Information allows you to import cast information from an existing drill. This includes names, labels, and Real View visuals (or Figurine data if the Classic Perspective is enabled). Imported data will overwrite any existing Cast List data. Print/Preview will open the page setup display and show a preview of the Cast List report according to the settings of the Print Cast Sheet dialog. Save as Default saves the settings of the Sort order. Done exits the Print Cast Sheet window.